Otis Spofford is the companion book to 1951's Ellen Tebbits. Unlike Ellen, who is mild-mannered and well-behaved, Otis is a spirited troublemaker who is always looking for ways to make his school day more interesting. Throughout this book, Otis causes trouble everywhere he goes. He doesn't quite believe his teacher's warnings that he will someday get his comeuppance until one day he does something to Ellen that might just be unforgivable. What is most interesting to me about this book is how completely terrible Otis's behavior really is. 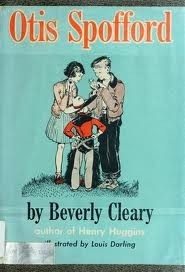 When I think of Beverly Cleary, I usually envision sympathetic characters like Ramona, who try hard, but make mistakes, or whose naughty behavior is a result of misunderstanding and frustration rather than true malice. Otis, though, almost borders on unlikable, as he terrorizes his classmates and teacher, all without much notice from his single mother, the dance instructor. Cleary also doesn't go to any great lengths to redeem Otis. The best she gives us is a chance for Ellen and her friend Austine to get a little bit of revenge, and even that doesn't seem to impress upon him how obnoxious and destructive he is. I know there are kids like Otis, and I think Cleary understands perfectly what makes them tick, but I'm not sure about the story's willingness to basically let him off the hook in the end. The other problem with this book by contemporary standards is the treatment of American Indians. There is a chapter in the book in which Otis's class is reading about Indians in their readers, and Otis is bored because all of the Indians are friendly and do not behave as they do in the movies he has seen. The vocabulary used in this section is very much a product of its time, and I think it is important to understand that context before becoming offended. Surely Beverly Cleary meant no harm, and there is some great commentary about the lameness of basal readers buried within this chapter that I really enjoyed. Still, there is a lot of talk about scalping and descriptions of kids making fun of Indians that might require some careful explanation and discussion for curious contemporary kids. As Beverly Cleary books go, this one feels like quite the anomaly, and it is probably the only one I would suggest parents pre-read before handing it to a child. Though it might be useful in helping kids understand why some of their classmates might enjoy misbehaving, the complete lack of a moral lesson at the end of the book could also easily send mixed messages. It's definitely the kind of book that will work well for some families, but not well at all for others.